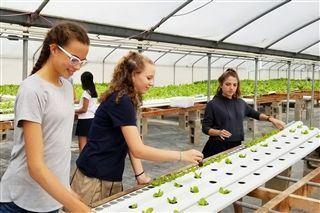 The Garden Club visited Sundial Farm in Vista to learn about its hydroponic operation. Sundial grows and harvests over 2,000 heads of greens (lettuce, kale, bok choy, swiss chard) per week for local school districts, restaurants and farmer’s markets. The students helped out by harvesting greens for the Vista Farmer’s Market, transplanting lettuce and cleaning equipment. Club members learned some innovative growing strategies that they are hoping to use with the hydroponics set-up on campus!